A few weeks ago The Wife and left Singapore for good and en route to Canada, we had a 8 hour early-morning stop in London, so we ventured into the city for a couple hours rather than just sitting at the airport. We were only going to be in the city during breakfast hours and since we had a big breakfast, I only tried the Oatso Simple Apple & Cherry Porridge. I tried it mainly because it was light (I had a full breakfast only 2 hours before), but more importantly it was absolutely POURING rain outside, so I wanted something to warm up a bit with. I had actually passed on the Porridge last time I was in Britain to give the breakfast wrap a try, and although I could be wrong, the Apple & Cherry may have been a new variant on the standard non-fruit flavour which is served with either jam, or syrup on the side. This also isn't the first time I've had porridge/oatmeal at a McDonald's although it usually takes on a slightly different form. 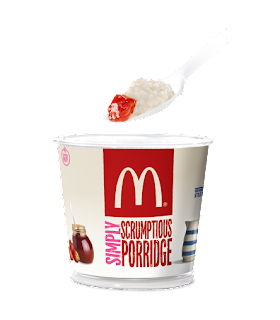 Since McDonald's used freshly boiled "organic semi-skimmed milk" to make the porridge, it took about 5 minutes to be served. The oats themselves were Quaker Oats Instant oats which I've had before at home, but never at McDonald's. I was pleasantly surprised to find the fruit inside was large, chunky, and full of juice and not just a few pieces of dried flakes added "for flavour". The apple pieces had a decent amount of crunch, but I found cherry to be the leading flavour here. The Wife thought it was a bit on the dry side, and so did I, but it wasn't dry enough that it was unpleasant. The other disappointment was that my bowl only ever ended up half full. They purposely leave room for the oats to expand (there are lines on the cup to mark it) but this never came anywhere near a full cup. I know it was only 99p, and in Britain, that's not going to get you very much, but it should get you more than 5 spoonfuls of instant oatmeal. After a 13 hour redeye flight to London, I think we still look pretty good. Don't we? We've also since settled in our new house in Bangkok, so the reviews should be coming more often now that our chaos of moving has finally come to an end. Keep an eye open!